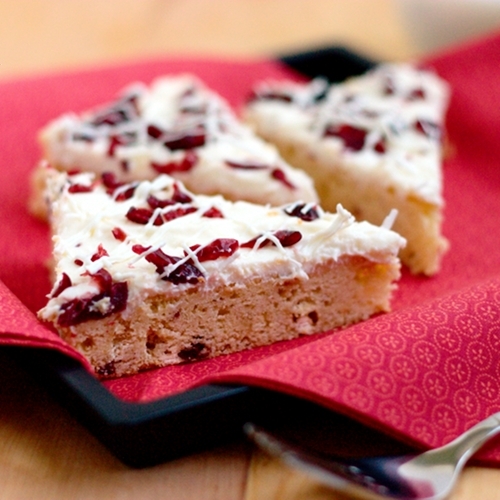 Is it so wrong that I love Starbucks' cranberry bliss bars so much that I felt inspired to bake some myself? Preheat the oven to 350 degree F. In a microwave, melt butter, stir in brown sugar. Transfer to a large bowl, cool to room temperature. Beat in eggs and vanilla. Combine flour, salt, baking powder and cinnamon, gradually add to butter mixture. Stir in cranberries and chopped chocolate (batter will be thick). Spread into 9x13-inch baking pan. Bake for 18-21 minutes or until toothpick inserted near the center comes out clean (do not over bake). Cool on the wire rack. To make frosting; In a large bowl, beat in cream cheese, sugar, orange peel and lemon juice until well blended. Gradually add half of the melted chocolate into the mixture and mix well. Frost brownies. Sprinkle with dried cranberries and drizzle with the remaining melted chocolate. Cut into bars and refrigerate. Note: Recipe is taken from Taste Of Home website. Tweaked just a little bit by me. Beautiful photos! 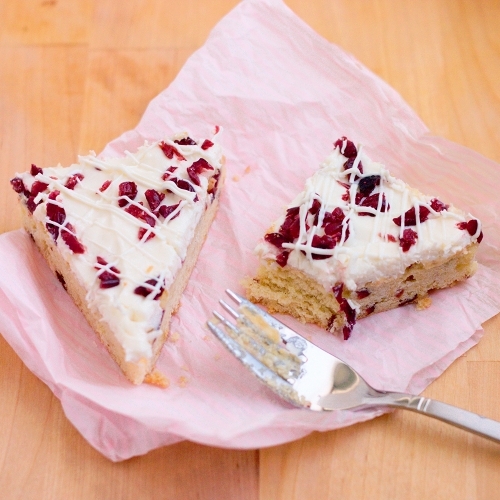 I love making things at home that I replicate from store bought goodies! So much more cost effective. These are lovely. I've never tried one of these bars from Starbucks. My husband LOVES their lemon loaf and I've swore that one of these days I would spend a day in the kitchen trying to recreate them. Those bars definitley look like "bliss" though :)! Lemon loaf will be my next project, since my younger one loves them so much. If you find a good recipe for that, do you mind to share it with me? They're so delicious, aren't they? These look so very elegant! :) Love how light they are, and how the cranberries pop. Sounds like a delicious treat.